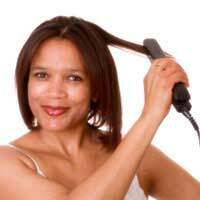 Straightening your hair can be a wonderful option for those days that you want to avoid going curly. However, before you begin there are a few techniques that you need to be aware of in order to get the safest, best looking results. Before manually straightening your hair with a straightening tool or a blow dryer you need to shampoo and condition your hair. Starting with clean, dry, well-conditioned hair will reduce the amount of damage that is done to your hair from the applied heat. For better, longer-lasting results you will also need to apply a styling agent, such as a gel, that will help hold the straightened style in place. When chemically straightening your hair you will still need to shampoo and condition, but you will also need to allow your hair to completely dry or dry it with a blow dryer before treatment. And, before beginning the treatment, you will need to apply a protective barrier, such as petroleum jelly, to the scalp at the hairline. This will help prevent any skin burning or irritation from the chemicals. There are four main things to remember when manually straightening your hair, whether you are using the blow dry method or a hair-straightening tool. First, never allow the heat to rest or concentrate on one area of your hair for more than 3 to 5 seconds at a time. By keeping the heat moving you can avoid damaging the hair strand and drying out the hair. Second, never use a higher heat setting than is necessary. Too much heat can damage the hair strand and lead to breakage, weakness, and eventual hair loss. Choose the lowest setting possible to begin and increase the heat slowly until you reach the most effective setting. Third, only work on small sections at one time. By dividing the hair to be straightened into smaller sections you can avoid prolonged heat contact and concentrate more effectively on reaching the desired straightness without working any sections too hard. Finally, try not to over-handle your hair while straightening the strands with heat. Hair strands are weaker and more susceptible to damage when warm so you should avoid excess pulling, tugging, or manipulation until the hair temperature has cooled. Chemical hair straightening can be more hazardous to your hair's health than manual straightening if not done properly. For the best results follow these tips. Always perform a strand test. A strand test will ensure that the chemical formulation that you have chosen is right for your hair type and eliminate the possibility of permanent hair damage. To do the test, simply choose a small (about 1 to 2 inches) section of clean, dry hair and apply the straightening chemical in accordance with the directions on the package. Wait the recommended time and then rinse the chemical, apply the neutraliser and allow the strand to dry. Once the hair is dry check for excessive drying, frizzing, breakage, or other damage. If any are present, do not use the product on the rest of your hair. When straightening never leave the product on for longer than the recommended time. The longer the chemicals are in contact with your hair the more damage they will do to your hair strands. Always rinse chemicals from you hair thoroughly with warm, clear water. If any chemicals are allowed to remain they can permanently damage your hair and eventually result in hair loss. Always use the included neutraliser. If with proper rinsing the neutraliser must be used to stop any chemical reactions and set the hair in its new straight position. Always condition hair after chemical straightening. The harsh chemicals used in chemical straightening always weaken hair strands and proper conditioning techniques can restore the softness and elasticity to chemically processed hair, helping to keep it healthier longer. If you take the time to prep your hair and use only the safest techniques you can consistently enjoy the straightened look of your hair without causing permanent damage.